I like this time of year in Portland. It’s fairly dry and while it’s cold, the sun is often out. I will take sunny but cold any day! The rain usually starts around January and doesn’t let up until sometimes July. The leaves are almost done falling too. Everything is just bare and spindly. I think it’s also time to start decorating the house for the holidays! I’d planned on decorating the house on Thursday but that plan changed. Michael had a stressful week so he suggested we go out to dinner. I offered to make dinner and do all the cleaning but I think he just wanted to get out of the house and break up the monotony of the work week. I totally get that. My poor guy! 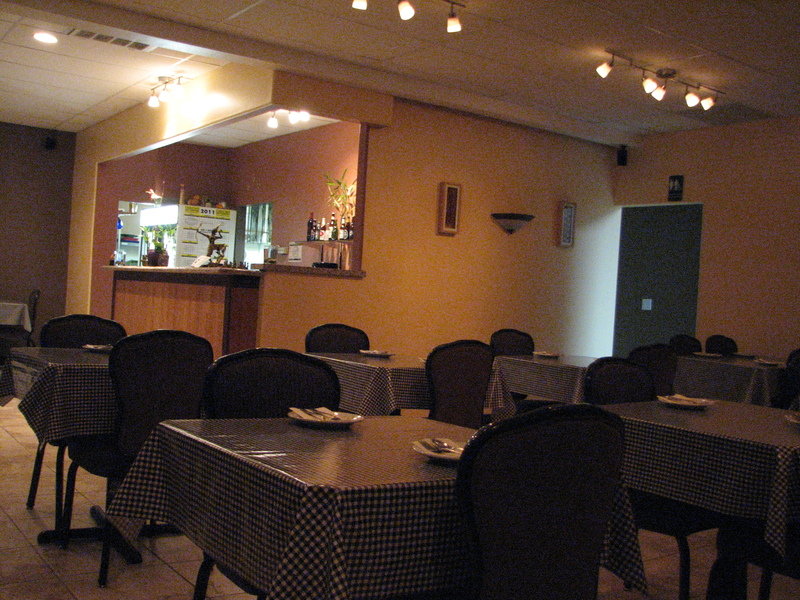 I suggested we check out Manao since we had a Living Social deal for it. Manao is the new Thai restaurant in Sellwood from the owner of the amazing Pok Pok. I love Pok Pok, so I had high expectations about this place. While it fell short of Pok Pok, it was still decent food. The place was pretty empty when we got there but a few more people showed up and it was about half full. 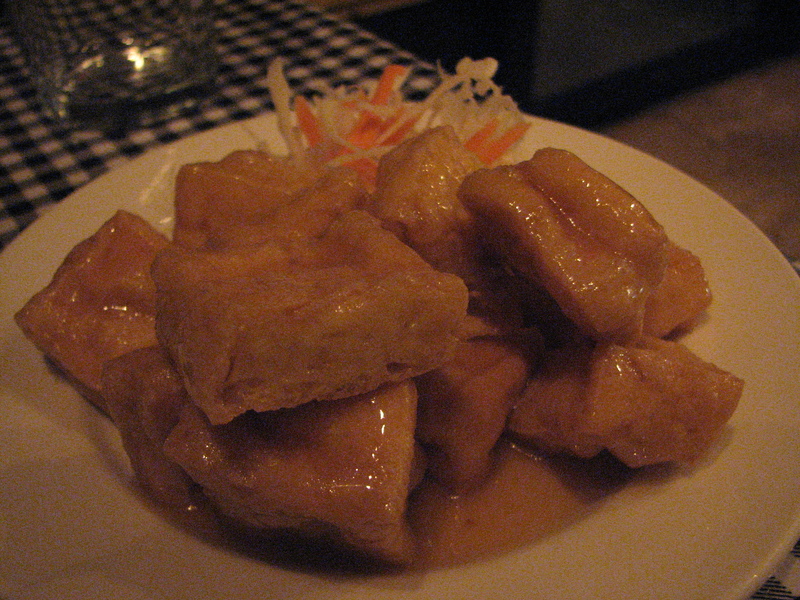 We started with a small appetizer of fried caramelized tofu with sweet and sour sauce. It was pretty good, even though I’m not a huge tofu fan. We ordered two entrees to share. The one I wanted was the PAD PAK RUAM. My dish was stir-fried chicken with Chinese broccoli, carrots, cabbage, onions, and green onions served with jasmine rice. 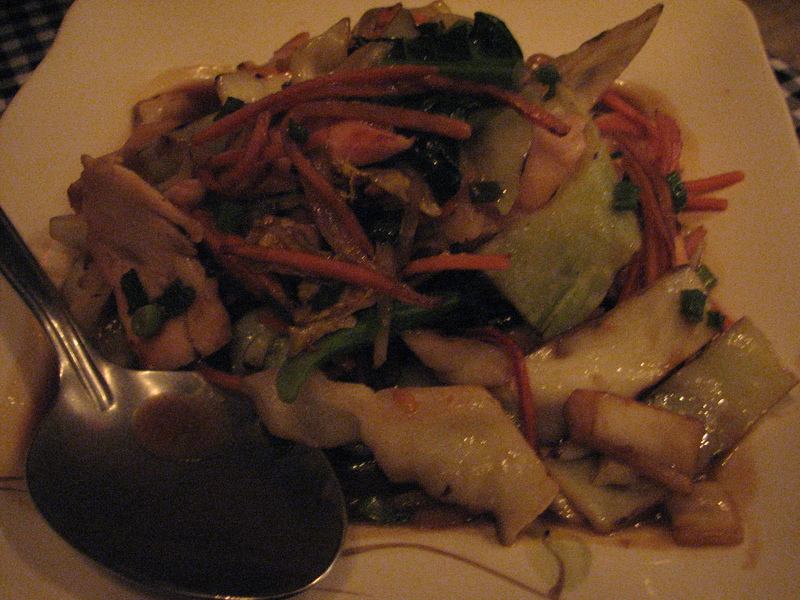 The sauce was mild but delicious and I absolutely loved the crunchy cabbage and carrots! Michael got the PAD KII MAO. 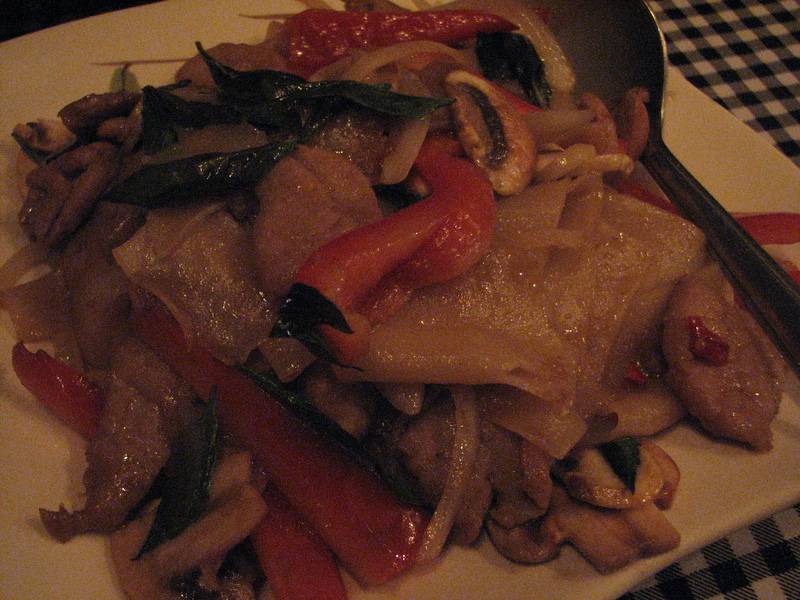 It was stir-fried wide rice noodle with pork, red bell pepper, onions, mushroom, and basil in soy sauce. The noodles were a bit slimy and hard to eat but they were delicious. Michael ate all the mushrooms. 😛 Yuck! I liked the food. It was pretty spicy but not sweat-inducing spicy like Pok Pok was! I enjoyed one glass of chardonnay with dinner and that helped with the spice a bit. I had the leftovers for lunch the next day. Even better! My only complaint about the restaurant was the table cloth. They were a black and white gingham pattern that made both Michael and I nauseated. I felt dizzy because the pattern was so crazy! My suggestion would be to get rid of those and make them a solid color. Ooof. I really wanted to stop for frozen yogurt on the way home. I’d left the coupon for the place near our house at home so we didn’t stop. Once I was home I was tempted to go back out and get us dessert. So tempted. I debated with myself why I should and shouldn’t go. I decided not to. Skipping dessert was okay. I didn’t need to go back out, especially since I was pretty full from dinner. Non-scale victory! Sometimes it’s nice to just get out of the house and change up the routine. QUESTION: What’s your favorite cuisine? Love the picture of the fountain. 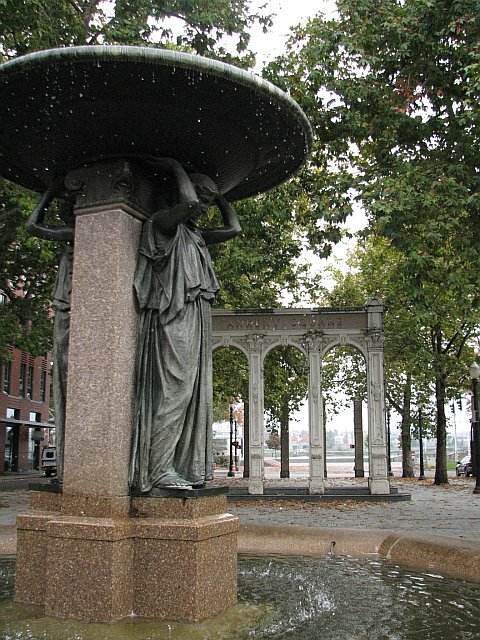 I would really love to visit Portland. 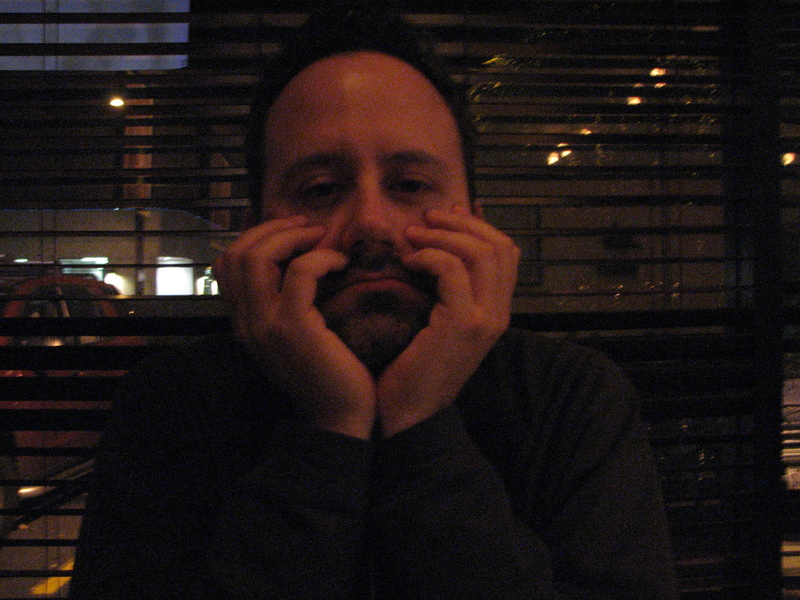 Not sure why I have not done so…Brief layover after a move back to central California from Seattle. Gingham table cloth with that Thai food seems to me…all wrong. Yeah I don’t get the table clothes. And they were weird for sure. The food was decent. I’m always a fan of Thai! You should definitely visit us up North. Summertime is the best time. Sometimes it just is nice to get out of the house when stressed. I like Thai food, but my very, very favorite is Indian. Yum!!! Lori recently posted..Weekend wrap up and new axe! I love Indian too. Especially Ethiopian. I love Thai and Japanese food! Im so plain and boring I shouldnt be allowed to respond. There’s nothing wrong with sushi! I love sushi. My favorite cuisine is Italian – I love pasta and red sauce. I don’t eat it too much because of the calories, but I do love, love! I commented to Michael on Saturday night that I used to love Italian food but rarely eat it now because of the calories.